Your Amazing Places, a leading world tourism website, has chosen Cai Rang as one of the top 5 Asian floating markets. Cai Rang – the largest whole sale floating market in the Mekong Delta, specializes in selling fruits and other agricultural products.In addition toagriculture products, themarket has all the customary services of a normal market. 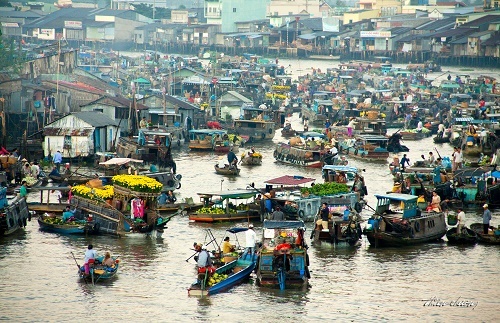 The market is about six kilometres from Can Tho city, or about a 30-minute boat ride. Rounding out the list of top five floating markets are Damnoen Saduak and Taling Chan in Thailand, Dal Lake in India and Nam Pan in Myanmar./.